The primaries are over and now we Americans and the world get to see the time honored spectacles of the Republican and Democratic Conventions. A place where party faithful come and listen to leaders of their party paint a vision of tomorrow and in turn try to convince the greater party members and those of other parties that their vision is better. Sound nice on paper, doesn’t it? However, many times, and it looks like especially with this election, the paper is a little thin on specifics and heavy on hyperbole. Nevertheless, this article isn’t really about our electoral process or this specific election as it is a similarly to what many CEO practice; business plans that are thin on specifics and heavy on hyperbole. We were taught when we were young that the quickest route between two points was a straight line (it is actually a great circle, at least when it comes to navigation; I add this because I don’t want the fact checkers to have a snit). So why are so many businesses without not only a strategic business plan, but a tactical plan as well? Ask a CEO what the business plan is, and they will give you a bullet pointed executive summary as proof that there is a plan. While this limited executive summary is better than nothing; it really isn’t much. It is talking points, and as we saw in the primaries, they get old after a while, especially without any meat to backup those talking points. And by meat, we’re talking facts, figures, roadmaps, tasks, milestones, dates, timing, slippage and ultimately [sub]-goals. Now let’s be fair to our CEOs. Not every company has the talent or budget to have a planning department in their company. Planning takes time, a tremendous amount of time. Time that many feel is unproductive, failing to meet the goal of producing revenue. This can’t be farther than the truth (within reason). This is why we have the old military adage, the 5P’s. Proper Planning Prevents Poor Performance. Five simple words that say it all. Of the two types of planning, strategic is the most common. Why, because you can create your bullet pointed executive summary, having for all intents and purposes a strategic plan, albeit a thin plan, but a plan nonetheless. Most people can think strategically to some extent. Moreover, if you are a CEO or business owner, you’ve at least identified long-term or overall aims and interests and the some means of achieving them. 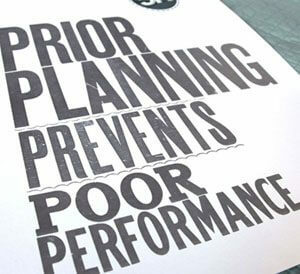 That is for better or worse a strategic plan. Where we are, where we want to go and some reasons why they will be able to achieve their goal. Tactical plans give you a step-by-step, inch-by-inch recipe of how to go from here to there. They should provide milestones, timing, be quantifiable, be able to be monitored, measured and have the ability for feedback. Tactical planning is more difficult because you need to get down in the mud and get dirty. It’s easy to say (and every politician has said this) “I will keep our streets safe!” That is a great strategic plan and even a better political slogan since it imbues itself to the psychology of the voter; I want my family and friends safe. However, how you get there is complicated and complex. Your plan needs to match that complexity, but be dynamic enough to change with the situation. A business plan needs to be dynamic. Static plans will fail once there is a choice that was not imagined on the decision tree of the plan. Think of the term “abort”; a computer term meaning abnormal termination. The programmers did not think of every single possible result and the computer system, which is in some respects static, just gave up (especially older computer systems). Your business plan is a living document. Simply as your business grows and changes, so too should your business plan. As a CEO you see an opportunity that needs to be exploited. Your business plan should be adjusted to reflect this new deviation, which in reality may be the ultimate in a dynamic system, change and that change brining profitability as a result. Next time you are in a position to hear a pitch about a company, think about if there is any real planning behind the hyperbole. Remember the more planning the better chance of success! Previous Post: Who really makes the Budget?